With over 70 miles of pollution free coastline and warm, crystal clear azure waters, Barbados has superb conditions for sailing and an exciting range of coastal cruises for visitors to choose from that is best suited to your taste. Barbados offers a huge fleet of well-maintained vessels with full-trained captains and crew, who all seem to have that wonderful warm Bajan spirit & friendly attitudes. The variety of cruises is wide - from the luxurious, sleek mega-catamarans, to the wild & fun party cruises, and the smaller, more intimate 'take-it-easy' mono-hulls. 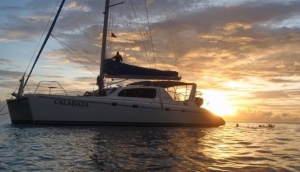 Blue Skies Cruises’ Lantana is the only monohull yacht available for charter in Barbados.